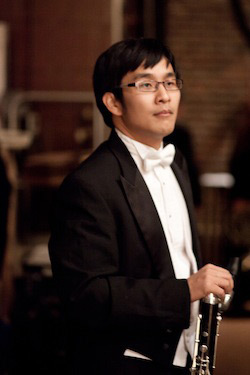 A native of Honolulu, Hawaii, Lyle Wong is a graduate of the University of Michigan and the University of Cincinnati College-Conservatory of Music. As an orchestral musician, Lyle was previously a member of the Opera Cleveland Orchestra and Symphony of Northwest Arkansas. He has performed with the Cincinnati Symphony/Pops/Opera Orchestras, Honolulu Symphony Orchestra, Dayton Philharmonic Orchestra, Orlando Philharmonic Orchestra and Philadelphia Ballet Company. Lyle's discography includes a 2007 Grammy winning CD with Leonard Slatkin and the Naxos Label for William Bolcom's Songs of Innocence and Experience. He has also recorded The Planets with Paavo Jarvi and the Cincinnati Symphony Orchestra under the Telarc Label, Shostakovich's Symphony No. 6 with Neal Gittleman and the DPO Alive Label, and two recordings with Michael Haithcock and the University of Michigan under the Equilibrium Label. During the summers, Lyle has participated in summer music festivals which include the Music Academy of the West, National Repertory Orchestra, National Orchestral Institute, Brevard Music Festival, Madeline Island Music Festival and Interlochen Arts Festival. Currently, Lyle is the Utility Clarinet/Bass Clarinet with your Arkansas Symphony Orchestra and the Delaware Symphony Orchestra. He is also the Head Orchestra Librarian for the Louisiana Philharmonic and the Music Academy of the West.